"Effloresce" redirects here. For the album by Oceansize, see Effloresce (album). Look up efflorescence in Wiktionary, the free dictionary. Efflorescences can occur in natural and built environments. On porous construction materials it may present a cosmetic outer problem only (primary efflorescence causing staining), but can sometimes indicate internal structural weakness (migration/degradation of component materials). Efflorescence may clog the pores of porous materials, resulting the destruction of those materials by internal water pressure, as seen in the spalling of brick. A 5 molar concentration aqueous droplet of NaCl will spontaneously crystallize at 45% relative humidity (298 K) to form an NaCl cube by the mechanism of homogeneous nucleation. The original water is released to the gas phase. Gypsum (CaSO4.2H2O) is a hydrate solid that, in a sufficiently dry environment, will give up its water to the gas phase and form anhydrite (CaSO4). Copper(II) sulfate (bluestone) (CuSO4.5H2O) is a blue crystalline solid that when exposed to air, slowly loses water of crystallization from its surface to form a white layer of anhydrous copper(II) sulfate. Sodium carbonate deca hydrate (Na2CO3.10H2O) will lose water when exposed to air. For controlling primary efflorescence, formulations containing liquid fatty acid mixtures (e.g., oleic acid and linoleic acid) have commonly been used. The oily liquid admixture is introduced into the batch mix at an early stage by coating onto the sand particles prior to the introduction of any mix water, so that the oily admixture is distributed uniformly throughout the concrete batch mix. For controlling secondary efflorescence, admixtures containing aqueous-based calcium stearate dispersion (CSD) are often added at a later stage of the batching process with the mix water. In a typical batching process, sand is first charged into the mixer, then the oil-based primary anti-efflorescence admixture is added with constant mixing to allow the oil to coat the sand. Then coarse aggregates, colorants, and cement are added, followed by water. If CSD is used, it is then introduced usually at this point during or after the addition of the mix water. CSD is an aqueous dispersion wherein fine solid particles of calcium stearate are suspended in the water uniformly. Commercially available CSD has an average particle size of about 1 to 10 micrometres. The uniform distribution of CSD in the mix may render the resulting concrete masonry unit water repellent, as CSD particles are well distributed in the pores of the unit to interfere with the capillary movement of water. Calthemite is also a secondary deposit derived from concrete, mortar or lime, which can be mistakenly assumed to be efflorescence. Calthemites are usually deposited as calcite which is the most stable polymorph of calcium carbonate (CaCO3). 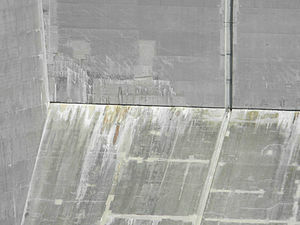 The only way to completely and permanently prevent (both primary and secondary) efflorescence in cementitious materials is by using special admixtures that chemically react with and bind the salt-based impurities in the concrete when hydrogen (H) is present. The chemical reaction in these special additives fuses the sodium chloride on a nanomolecular level, converting it into non-sodium chemicals and other harmless matter that will not leach out or migrate to the surface. In fact, the nanotechnology in these additives can be up to 100,000 times smaller than even the smallest cement particles, allowing their molecules to literally pass through cement minerals or sand particles and ultimately become part of the cement or sand with which they react. And since they require the presence of hydrogen they stop reacting as the concrete dries out and begin reacting again when the concrete is exposed to moisture. Efflorescence can often be removed from concrete using phosphoric acid. After application the acid dilution is neutralised with mild diluted detergent, and then well rinsed with water. However, if the source of the water penetration is not addressed efflorescence may reappear. Certain cement types are more resistant to chlorides than others. The choice of cement, therefore, can have a large effect upon the concrete's reaction to chlorides. Primary efflorescence on a brick wall in Germany. Primary efflorescence on a firestop mortar at Mississauga Civic Centre in Mississauga, Ontario City Hall. Substantial primary efflorescence on a building in Denver, Colorado. Concrete derived secondary deposit of calcium carbonate creating calthemite stalactites, which can be mistakenly confused with efflorescence. Wikimedia Commons has media related to Efflorescence.